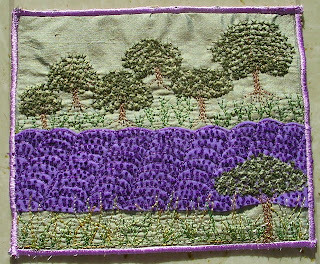 Here is the finished piece, with lavender and olive trees, for the TIF challenge. Beautiful - I just love the colours - and your stitching is great! I love it too! Especially like the combination of machine and hand stitching. wonderful! lavender is sooo pretty,and its color looks even better with thee trees. Beautiful! I love all of the texture. When I looked at the picture, I immediately thought it was a field of lavender -- before I read the description. WoW ! I can't believe you're done so soon ! It's a wonderful piece- great stitching ! what a delightful miniature! the texture and colors really create a farmland vista. Das gefällt mir sehr, es sind so "feine" Farben, die wunderbar harmonisieren. Es ist Dir wirklich gut gelungen. I liked this before, but the texture from the embroidery makes it even better. Oh how lovely - you have really made the most of the palette! This looks very much like I would imagine your area looks. I can hear a kookaburra laughing as I type this! He is in the tree outside the door. I really love the trees! Great job. It's beautiful. I love the colours and the texture. 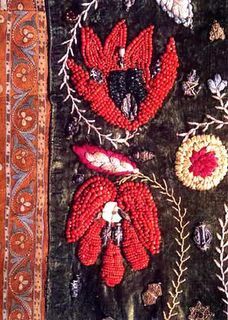 Oh my God, all those french knots! Very beautiful. Makes one wish to go the the Provence at once! super!that would make a great advertisement for Tourism Provence. What a great use of that color scheme. I see so many TIF people not liking it. They should see what you've done - they'd change their minds pretty quickly. You made a beautiful TIF! Your piece makes me want to get some lavender and make a posey. What a beautiful lavender field! This is so beautiful in every detail! Oh Vero, this is just beautiful! Ist ja ganz toll geworden. Es sind eigentlich nichtmeine FArben,aber so sieht das wunderbar aus! 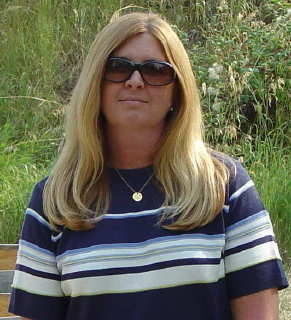 Ton Schulten or not ?